Stealing Magic by Marianne Malone, a Mysterious Review. Review: Sixth graders Ruthie Stewart and Jack Tucker learn someone has discovered their secret, the ability to shrink in size to visit the interiors of the Thorne Rooms, a series of 68 miniature rooms featuring different periods of time housed within the Art Institute of Chicago, in Stealing Magic, a sequel to the first book in this series, The Sixty-Eight Rooms by Marianne Malone and illustrated by Greg Call. During their previous adventure, Ruthie and Jack had left a note within a box, a sort of calling card, with information on how they came upon the magic required to visit the rooms. Now someone has written something at the bottom of that very same note: "If this is not a joke, leave another note." But the words, though tiny, appear to have been written by someone full size, suggesting they were not aware of the magic. And what's more alarming, some items are missing from the rooms, items that apparently have magic of their own, allowing Ruthie and Jack to walk outside the room into the past. Were they taken by the same person who wrote the note? And could any of this be related to a series of art thefts taking place in Chicago? The furniture was covered in rich silks and satins. One wall was decorated with a tapestry of a city scene in geometric shapes, like a painting by Picasso. [Ruthie] walked over to touch the surface. Her hand felt the small stitches, and she marveled at how incredibly tiny they must have been to the full-sized hand that made them. … The balcony — which was separate from the rooftop garden — was big enough for a table and chairs, the glass-topped table was set with two golden water goblets and shiny green plates. Cheery zinnias bloomed from two orange planters. Out of sight to museum visitors, a spiral staircase wound down to a small enclosed courtyard between the building and street. These journeys also provide a number of heart-warming surprises that are revealed towards the end of the book. But neither of these mini-adventures play a part in their solving the crime of who is stealing treasures from the Thorne Rooms or local residents, itself a nicely plotted mystery with an elegantly devised scheme to trap the thief. 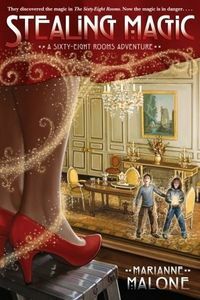 The target audience of middle-school readers — both boys and girls — will likely enjoy Stealing Magic as it packs quite a bit of excitement and mystery into its storyline. But adults, too, may find themselves "stealing" the book from their kids to read as escapist entertainment. As of the date of this review, Stealing Magic has not yet been assigned a Lexile measure. The previous book, The Sixty-Eight Rooms, was rated 730L and this current book is likely to be comparable. Acknowledgment: Random House provided an eARC of Stealing Magic for this review.